So I have decided on a build. I am going to make 2 separate enclosures each roughly 36X24X16. I have designed them on Fusion 360 (a CAD program). I will be building them out of 1 sheet of Hardwood Plywood each and Plexiglas. I am not doing it to try to save money vs buying a pre-made plastic one. I enjoy "projects". My wife says I need to have one at all times to be happy. I have always enjoyed making things myself. 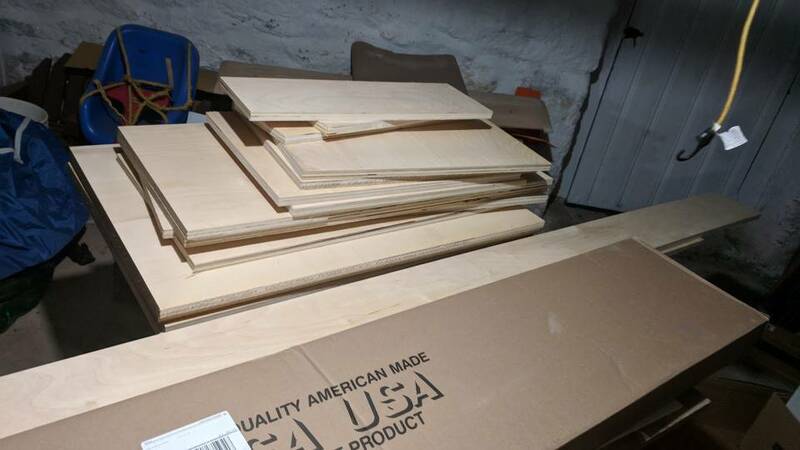 2 - 4X8 hardwood plywood. Had Home Depot cut it for me. $53./ea. - total $106. 1.5 qrt. - Black Pond epoxy (Hope this is enough for both) $65. Hinges. Thinking of going with a hidden hinge like a cabinet. May make entire front of enclosures be a door. latches. Need to make sure they lock somehow so kids can't get in without me. Stain for exterior. I like light wood stains. May have some on shelf from last project. Plexiglas from local glass shop so I don't have to bother cutting it. The wife and kids all want to help with the build. Glad everyone is excited (helps get the cost by with less difficulty). My 9 year old daughter spent 2 hours yesterday asking questions about BP health and care. I will update as the build progresses. Pile of pre cut wood. Saved a lot of time having them cut it for free. Very cool your daughter is interested in this. Sounds like you have a future snake keeper on your hands! You should be good on the 1 bag of reptile prime. I get 2 full 4'x2' cages out of 1 bag. Sounds like a fun project, looking forward to seeing progress pics, or at least the finished project. How thick do you put it down. Only post I could find said 1/2 inch. Eh... probably close to 1 inch before the snakes pack it down. It is fairly loose initially. Ends up being around 1/2" packed, but I do clear it out from under water bowls so that saves me some coverage. We have spent a bit of time looking at different photos on here together seeing what we like and might want. She is very excited. We both like the varieties with a lot of yellow in them. So I got around to starting the build today with the "help" my two daughters age 7 and 9. I took this opportunity to start teaching them some things about carpentry as handing me screws and holding the glue doesn't work anymore. This gave me the idea that some people here might not know a few good tips I have learned over the years. I learned a new one today also. Don't have Home Depot cut your plywood for you they are very accurate. Need to do some creative sanding and gluing but I can save it. Mind the mess its been near in the single digits lately so I cleared some room in the basement to start working. 1: Don't have the saw blade to low. It should be set just below the thickness of the wood. This will help prevent chipping with plywood. 2: Use a long flat edge and some clamps to make a guide for your saw so you make really straight accurate cuts. Here are some photos of the first one minus the front. I have the front door clamped and gluing right now so all in all it took me about 2.5 hours to get one cage built. Need to mount Plexiglas and hardware. Got the second box assembled today. took about 2 hours on my own. This time I did some corrective cuts to fix the less then stellar cuts from Home Depot. This one is far far more square but about 1/4" less deep. I will have a lot less sanding to do on this one. This is a very easy Beginner level carpentry project as long as the initial cuts are good ones. This image has the front door on top of the black plastic clamped and gluing for at least 12 hrs. Still need to settle on hardware. Haven't decided how to latch and lock cage doors but I like that they are large it should help with access and cleaning. Also considering what to do about air vents. Think I may drill a series of holes and we can cover or uncover them as necessary. The vents I used for the Bearded Dragons cage is too big I feel. I am thinking along the lines of a series of holes in a circular pattern with a piece of wood screwed on one corner that we can swing around to cover more or less holes. Doing this on each side I feel should help in heat / humidity retention and give us some fine grain adjustments.